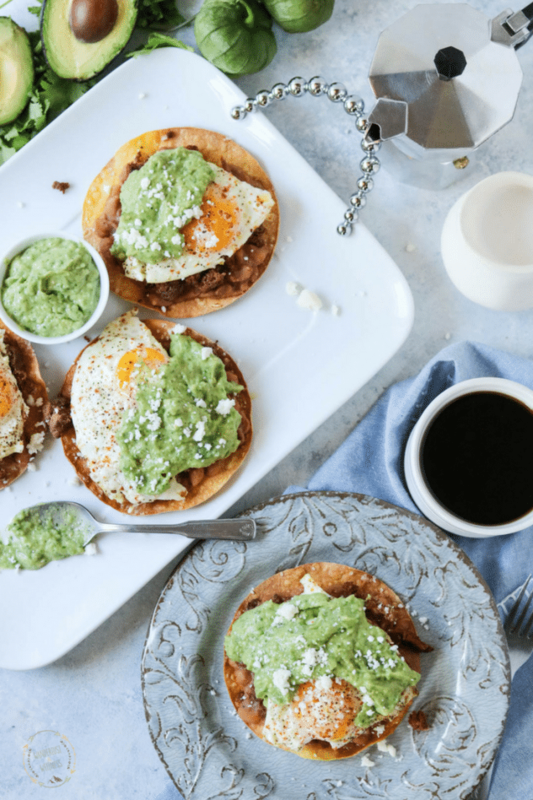 These southwest breakfast tostadas rank pretty high up on my list of favorite savory breakfasts. Which do you prefer, savory or sweet when it comes to breakfast? 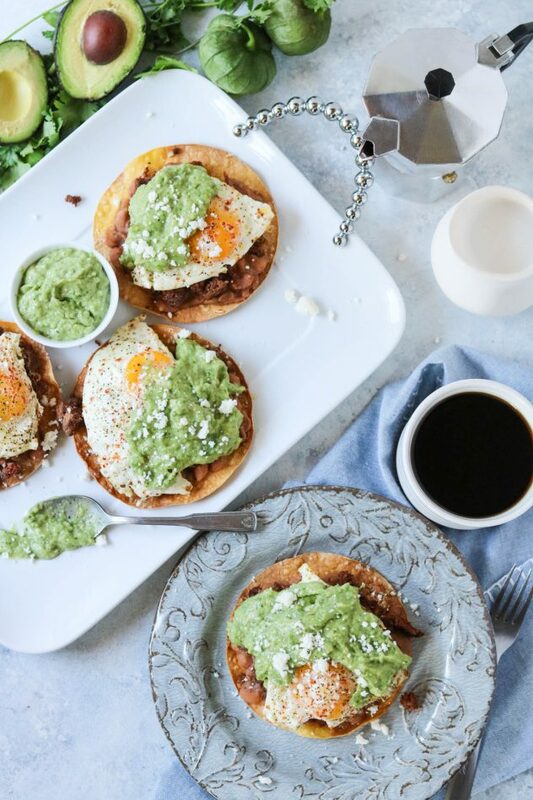 I’m not sure where to even start with these breakfast tostadas because there are so many delicious flavors! Let’s start with the creamy tomatillo salsa that is so fresh you won’t even miss your traditional guacamole. This is actually my first recipe using tomatillos and I had to ask myself what in the world I had been waiting for?! So good! Have you tried tomatillos before or cooked with them? They’re super easy, especially in this creamy salsa recipe. I wanted this recipe to be somewhat easy to make so I tried to keep each layer of the tostada fairly simple. They may look complicated, but they’re actually not. I had these fixed in under 45 minutes. These would also be great for brunch or feeding large groups. I’m thinking vacation breakfast on our next family vacation. Even though I only have one sibling, there are 7 kids between us, and now 4 1/2 grandkids on my side, which means family vacations are huge these days. Now that I’ve mentioned fixing this I have a feeling they may read this and hold me to it. If you guys follow me, you know my obsession with cotija cheese and Tajín Clásico Seasoning . It took me forever to find Tajin locally, so I ended up ordering from Amazon like everything else these days! 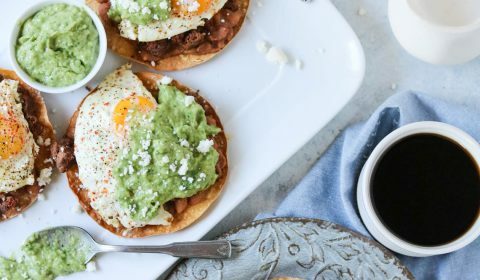 They added the perfect final touch to these southwest breakfast tostadas. You guys have to tell me if you try these tostadas and if you loved them as much as I did! 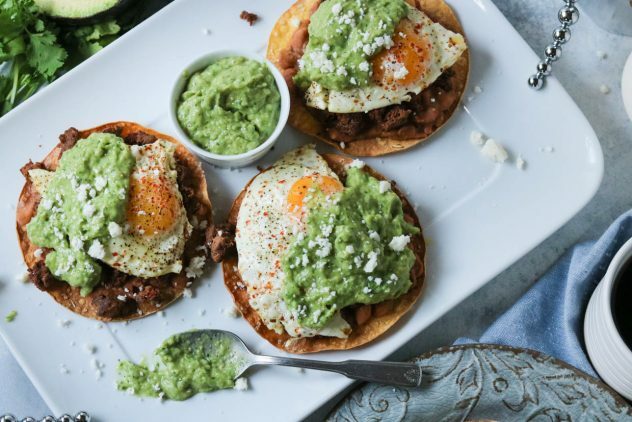 These southwest breakfast tostadas have a creamy avocado tomatillo salsa that is out of this world delicious, with beef chorizo, chipotle pinto beans, all topped with a savory egg and cotija cheese. In a skillet, add the beef chorizo and cook until done. Remove from heat once finished. While the chorizo is cooking, add the salsa ingredients: avocado, jalapeno, tomatillo, minced garlic, cilantro, lime juice, cumin, salt, and pepper to a food processor and pulse until smooth and creamy. Transfer to a small bowl and set aside. Add the beans to a small saucepan over medium heat. Remove one chipotle pepper from the can, chop, and add to the beans. Add the remaining bean ingredients: cumin, adobo sauce, minced garlic, salt, and pepper to the pan. Once the beans begin to heat up, turn the heat down to medium-low and let them simmer for 5-10 minutes. Using a fork or potato masher, smash the beans into a smooth consistency. Turn the heat to low to keep warm while you finish the remaining items. On a baking sheet, place the 4 corn tortillas. Brush with olive oil and season with salt. Bake for 10 minutes, then remove. In another skillet, add butter and melt over medium heat. Add the four eggs. Cook to your desired level, for my recipe I cooked the eggs over easy which means the yolk was still runny. To assemble your tostada, spread the bean mixture onto each tostada. Then add a layer of the beef chorizo. Top each with an egg and then add the avocado tomatillo salsa. Finally, top with crumbled cotija cheese and sprinkle with Tajin seasoning. This is right up my alley. Perfect for breakfast! I’m so ready to sit down to this, I’ve got a feeling though that this will my dinner! Love it! Can we make tostada Tuesday a thing? Because I want a weekly excuse to eat this! Chorizo is one of my faves! I just bought a bunch of tostada shells and corn taco shells at the grocery store that we on sale. I figured that this week it’d be a good time to use them up while it’s hot outside. I love that this recipe can be made with leftover vegetables and protein, too! This is definitely my kind of breakfast. You can’t go wrong with eggs and avocados!! I may go make this right now! I am envisioning these for a great brunch, or even breakfast for dinner, which is one of my favorites that I don’t do often enough! Such great flavors, and I love layering up a crunch tostada! It’s like a tostada and a slice of avocado toast had a child. This looks fantastic! I love tomatillos! Especially in combination with avocado, which breaks down the acidity and adds some creaminess! I have had this sauce in Mexico before but have never made it at home! I am sure it goes so well with eggs! So creamy and so easy to make, too! 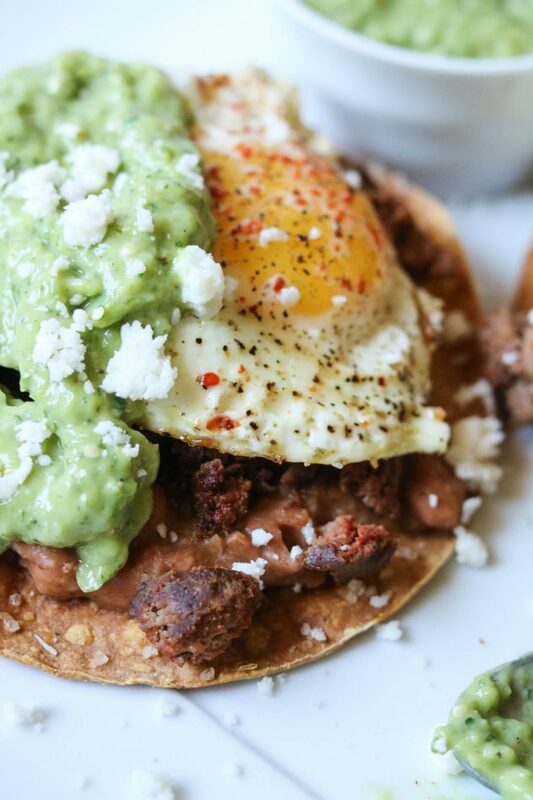 A recipe that combines two things I love: breakfast and tostadas. This is such a great find! I love how quick this recipe is to prepare. They look complicated but it’s really pretty easy to whip them together. Now this is my kind of breakfast. Well, more like brunch….but YES!! Wow, we love Mexican food, so this would be pefect, and I would even eat this for “breakfast for dinner” too.